Can Rapp-it be used as permanent repair? Rapp-it is intended as a temporary pipe repair for onsite emergency situations. Ultimately, usage and suitability of application is up to the discretion of the user. If the leaking pipe (live line) cannot be isolated, can Rapp-it Pipe Repair still be used? Yes, Rapp-it can be used to stem the flow of the pipe leak until an alternative procedure can be completed. Isolating the pipes is the most effective repair however we understand this cannot always be done. In that instance simply turn down the pressure as low as possible when applying Rapp-it. If the pipe has a small leak and is unable to be completely dry, can Rapp-it be used? Absolutely. Rapp-it Pipe Repair is ideal for use in wet applications. We suggest the pipe be cleaned and roughened first to ensure a successful repair. Can Rapp-it Pipe Repair be used underwater? Yes, both Rapp-it Pipe Repair Bandage and Rapp-it Steel Putty can be used underwater in either fresh or salt water. Curing time may vary according to the temperature of the water. Cold water will increase the cure time and hot water will reduce the cure time. What is the recommended thickness of Rapp-it? Our recommended Rapp-it repair thickness is a minimum of 10mm or approximately 12-15 wraps around the pipe. We also recommend the repair extends 50mm either side of the damaged area. What is the cure time for Rapp-it Pipe Repair System? As soon as the foil bandage packet is opened the bandage will start to cure. Rapp-it Bandage has a working life of 4-5 minutes and a full cure time of 30 minutes. Rapp-it Steel Putty has a working life of 2-5 minutes and a full cure time of 30 minutes. Can Rapp-it be used on larger diameter pipes? Yes. We supply the RAP304 (100mm x 9m) for larger diameter pipes and elbows. Multiple bandages may be required for very large pipes. Can I repair my pipe using only the bandage? Yes, Rapp-it Pipe Repair Bandage can be used alone. We do recommend the combination of Rapp-it Steel Putty along with our Rapp-it Pipe Repair Bandage to ensure a more successful pipe repair. How can I remove Rapp-it once it’s cured? 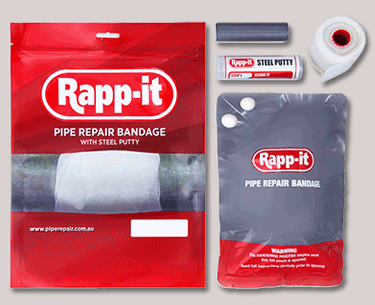 Rapp-it Pipe Repair Bandages can be removed with a hacksaw or angle grinder. Hammer and coal chisel is also an effective method of removing the bandage. When using an angle grinder, always use a respirator during the removal. Always check the fluid/gas in the pipe first as fluid or medium may be flammable and ensure appropriate PPE (Personal Protection Equipment) is worn at all times. Does Rapp-it have an expiry date? Rapp-it’s shelf life is approximately 2 years from date of purchase if stored below 25°C (77°F), and the foil pouch is not punctured. Can Rapp-it be used on an underground or buried pipe? Yes, however as Rapp-it is a temporary repair we recommend a job and location report be filed so the repair location is recorded for when a permanent repair is arranged at a later date. What liquids/gas can I use Rapp-it on? Rapp-it is suitable for use on a wide variety of liquids, including potable water, diluted acids and fuels. Please refer to our Chemical Immersion Testing Results under the Rapp-it Certifications tab, for further information.